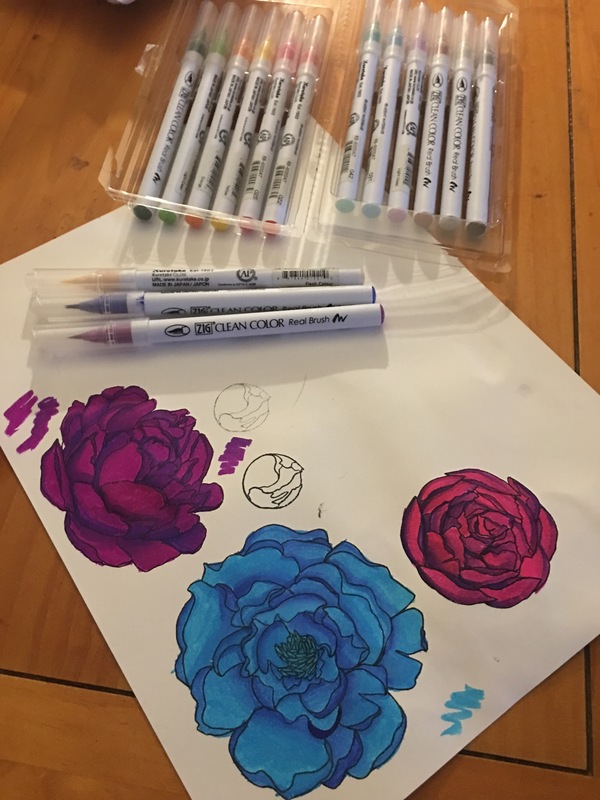 Zig clean color real brush pens, The Rocka block and mondo peony. All opinions here are my personal opinion and are not guided by any company or manufacturer. I do not get paid or receive perks for my reviews. I am doing the reviews to help my fellow crafters. 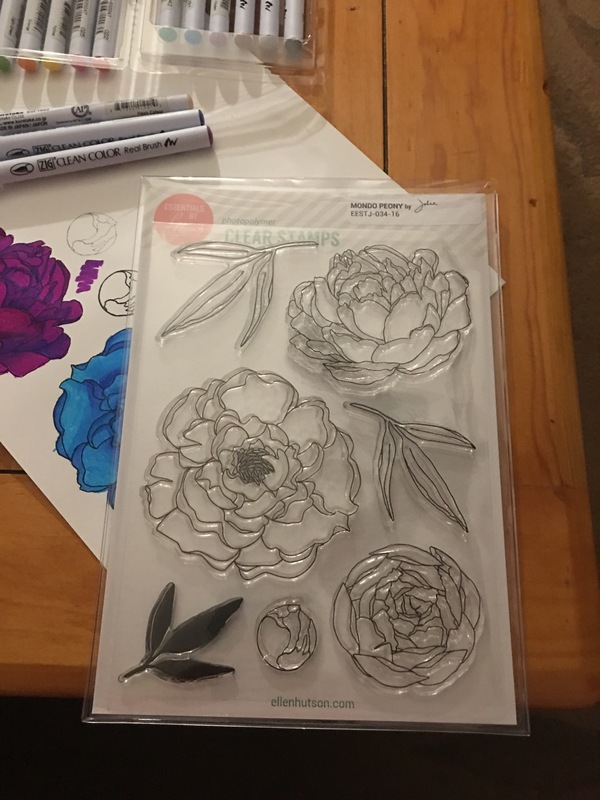 Ellen hutsons ” Mondo Peony” stamp set. The price on this stamp set at the current moment is $25. Now that may seem quite pricey but I promise you will never regret buying their product. This stamp set includes three large flowers ranging from 3″ to 3 5/8″ , one smaller bud and three leaves. 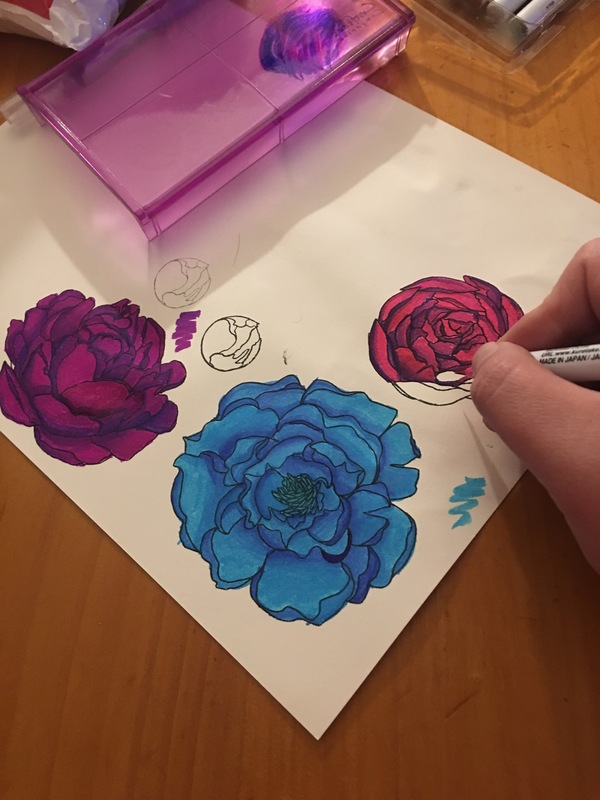 This is the perfect flower set to use for water color! I”ll admit I was hesitant to buy these pens . I watched a ton of tutorials on them and looked at them online day after day. After about two months of looking at them I put them in my cart on simonsaysstamp.com and never looked back. After receiving them I was scared to use them so I watched more tutorials on them. I finally had gained enough courage to try them tonight. Let me just tell you ladies and gents THESE PENS ARE FLIPPIN FABULOUS!! I am the worst watercolor artist ever and these pens make it soooo easy! It took a little playing around with them and a couple different techniques to get it just right but here I am feeling accomplishment at watercolor for once in my life. The paper used above is just some cheap white cardstock I picked up at my local craft store. Although I used the paper above I do recommend using watercolor paper for optimal results. These pens are water based and can pill the paper you use. The technique I used is one I seen on Jennifer Mcguire Inks video tutorials. She has a set of three videos that are very informative and so motivational. I will link to them below. The first step to this technique is to get a clean acrylic block and pick two colors that mix well. Next scribble the darkest zig pens right on it. With your lightest zig pen of choice rub the tip of the pen on the dark scribble picking up some of the color. This technique will give you an amazing ombre effect. You’ll notice in the picture I started off where the shadow should be and rubbed the pen out till the dark color had warn off. You can always go back and add more dark color afterwords so dont be afraid to make a mistake. 1- I own 16 out of 80 pens but by mixing them Ive already made about twenty different colors that I do not currently own. This means not all pen colors are needed to make my desired effect. 2- These pens have a very sleek barrel almost like a bic pen that work well for my small hands. 4- These pens make watercolor soo easy. This item is unbelievably amazing! 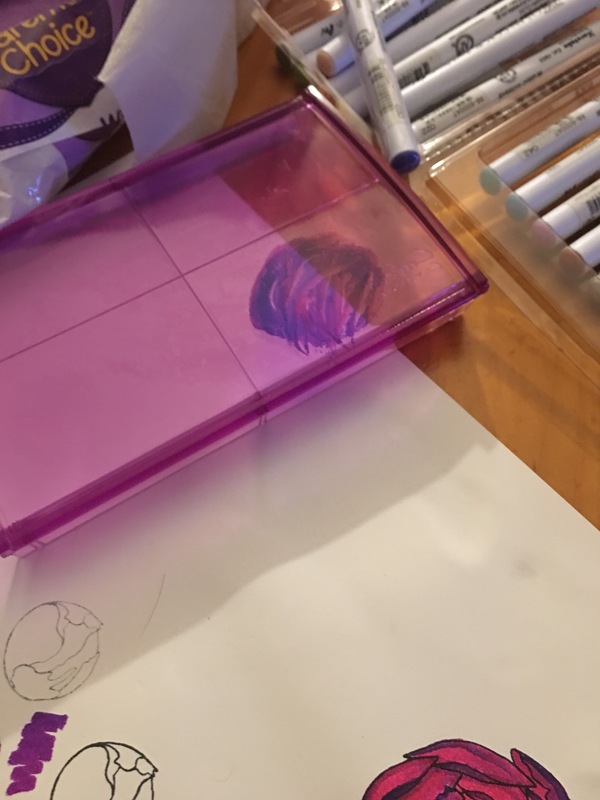 Have you ever stamped an image with a acrylic block only to get a less than satisfactory result ( missing ink, too much ink, smudges) I certainly have and it is the worse! This block is the miracle cure and answer to our crafters prayers. This block is different from the other acrylic blocks in the way it is shaped. The curved shape of this block alows us to to rock the stamp to press it on the paper. Rocking the stamp ensures that the stamp is evenly applied at all angles. 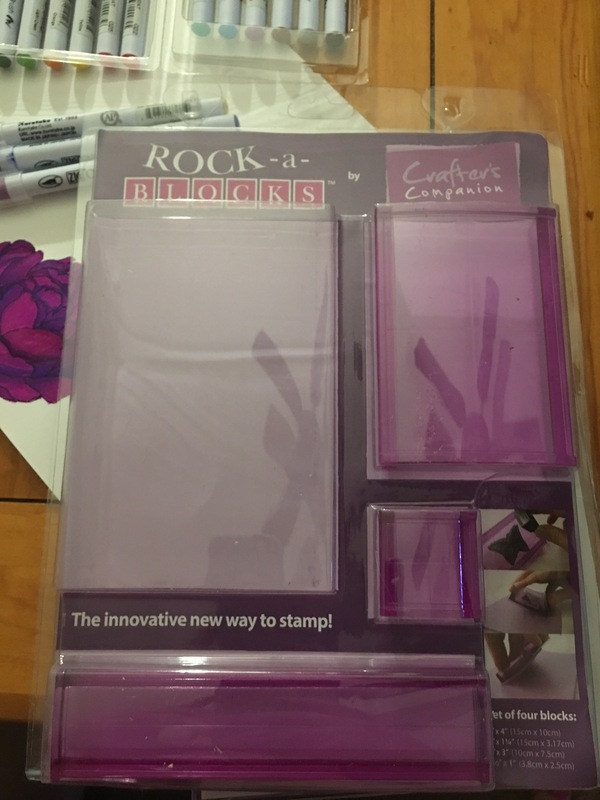 No more smuged, half printed sideways stamps for me! If you have any questions or suggestions please feel free to comment or contact me. This is just great, Jen! I am sure your love for crafting expressed through your blog will bless many.